Black and white photograph of Bill Donnelly driving The Northern Knight to a first place finish in the second half of the daily double on Friday, October 11, 1935 at Topsham Fair, Topsham, Maine. The daily double proved a $66 payout but Northern Knight served up the day's largest payout of $20.80 on a $2 ticket. 1935 marked the first year of pari-mutuel betting at the Topsham Fair and receipts surpassed $85,000 in total. 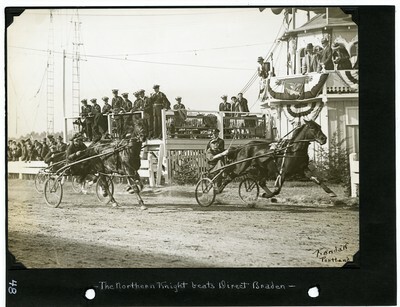 Note the photograph shows the Topsham fair track band stand and judges' stand with racetrack officials watching the finish. The photograph is signed in the lower right corner by photographer Guy Kendall.